Here are the best snow blower reviews so that you can take your best decision while buying a blower for your home. The Toro 38381 Snow Thrower is one of the best snow blowers for residential use. It is small and compact, but packs enough raw power to quickly and easily clear up snow from walkways, driveways and sidewalks. It is compact, wide, and has deep cutting blades that can help you get the job done in no time. It comes with a fifteen amp motor that enables you to move up to seven hundred pounds of snow in just a few minutes’ time. With just one pass, you can clear a path of eighteen inches wide and twelve inches deep. The Toro 38381 Electric Power Snow Thrower is built for convenience, due to being electrically powered. It only weighs approximately twenty-five pounds and is very easy to maneuver and use by all your family members. In addition, because it has an electrical motor, you’ll be working with an environmentally friendly product. There is an ergonomic handle that helps to provide maximum leverage and comfort for the user. There is also a Cord Lock, so that the user does not have to stop, due to interruption of power. The Toro 38381 Snow Thrower is completely maintenance-free and all you have to do is plug it in and go. Cuts up to ten inches deep and eight-teen inches wide with one pass. One buyer said that the Toro 38381 Snow Thrower worked for one six inch snow fall, approximately one week after he purchased it. Then, he tried it again two weeks later with eight inch snow fall, and the product began to stall with a racing motor just fine, but that the snow impeller did not move at all. Eventually, it stopped working all together. He stated that he called tech support several times, but was told that the problem was something different each time. He finally returned the item and said that he did not have a good experience. Another customer said that this is the best product he’s ever purchased. He said that he has had many snow throwers, but that this one is the best one he’s had and that he would recommend this to anyone. There was someone else who bought this snow blower because it was small and lightweight so it is easy on your back. It has a good amount of power so it took a lot less time to clear the driveway and there was no pain at all. He was very satisfied. There are hundreds of customer reviews about the Toro 38381 Snow Thrower. The majority of the reviews are positive and attest to the quality and power of this snow thrower. Although there are negative reviews, it is important to remember that every company and every product will have someone that gives a negative review. It is just not possible to avoid negative customer experiences for some buyers, due to various circumstances. The Toro 38381 Snow Thrower seems like a great purchase for those who need a quality and affordable snow thrower. The Murray 1695537 Gas Powered Snow Thrower, is one of the best snow blowers to use for light conditions of four to six inches of snow. When one blows wet snow with this product, the downtime is dramatically reduced. This snow blower is created and designed for residential use and it really works best with paved sidewalks and paved driveways. It has a Briggs & Stratton engine with four cycles. There is never any need to mix oil or gas together. The product is light in weight, at fifteen pounds, and this makes it easy to maneuver. This product is great for the small jobs around your home, with a clog resistant chute. 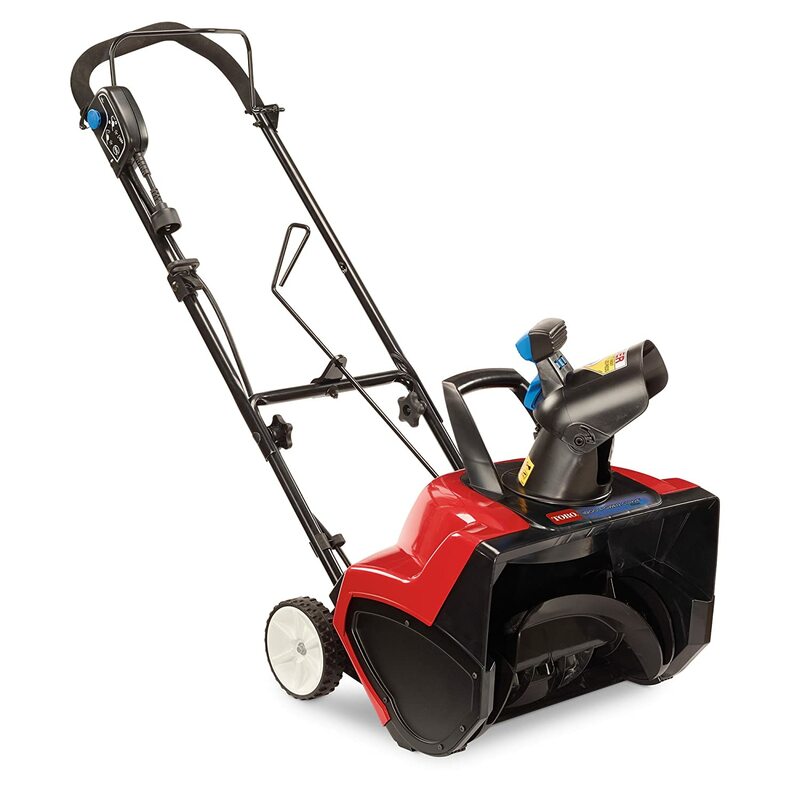 The handles of the Murray 1695537 Snow Thrower fold down and collapse for easy storage. As the snow blower is very light in weight it can be easily moved around from one place to another. Its light-weight proves to be very useful when there is a thick sheet of snow which you must get your snow thrower through. The chute that features in the snow thrower is resistant to clogging completely. 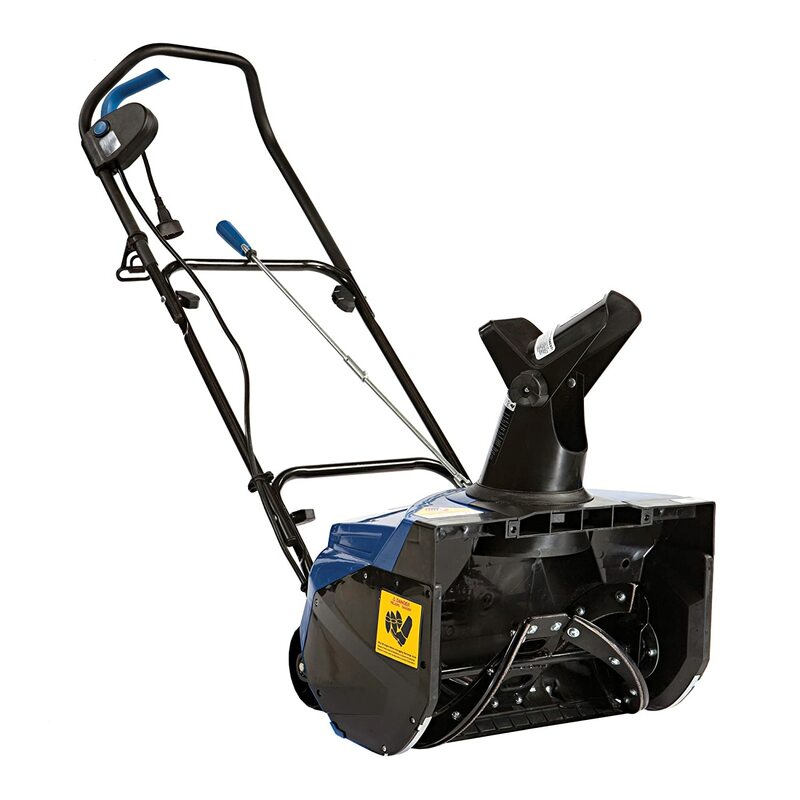 One buyer of the Murray 1695537 Gas Powered Snow Thrower, absolutely recommends this product. He said that it did exactly what it advertised and that he really was glad that he made the purchase. A second purchaser of the Murray snow blower stated that he has only used it a couple times, but that it worked great. He said that it chewed right through three feet of snow on his driveway and that there was no damage at all. He said that it was a good buy. A third buyer said that he decided to buy this snow thrower and that it chewed through at least one foot of snow quickly and easily. He said it was very easy to assemble and that it works very well. He said that he bought it after doing a lot of research and looking at different reviews of this product. He said that the product is very powerful, but still easy to maneuver and move around. He said that he recommends this purchase to anyone who is serious about their snow blowers. There were however some negative reviews also where people were having problems with the engine starting and the auger not turning. One of them also said that this snow blower did such a poor job on the driveway that they had to shovel anyway. The Murray 1695537 Gas Powered Snow Thrower might be a great snow thrower for those who live in areas where there is only four to six inches of snow fall per year. It is best for paved sidewalks and small jobs in a residential situation. Therefore, if you are going to have more than six inches of snow, you would consider a different product. On the other hand, you can probably take care of those small jobs around your home. However, due to the mixed reviews, it seems the Murray Gas Powered Snow Thrower is hit and miss and therefore would not be my first choice. WORX WG650 Electric Snow Blowers Reviews: The WORX WG650can help you to clear sidewalks, driveways, patios, decks and balconies quickly and easily. 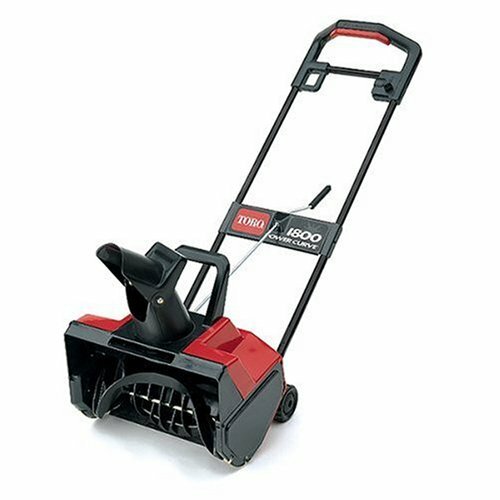 Th ere is a 13 amp motor that is electric and enables this snow thrower to clear a path of at least nine inches in depth and eighteen inches in width in just minutes. There is a handle bar that has a three position adjustment option, enabling you to choose the exact height that you want to work with. There is also an oversized chute adjustment that is very easy to use, especially with gloves. When you are not using this product, you can use the collapsible handlebar to fold and store away. One customer who purchased the WORX WG650 Electric Snow Thrower stated that for a small snow thrower, this product uses a very large ejection opening. He stated that this helped him a lot, but that it did not prevent any clogging of snow. He did state that it is very light in weight and that it can throw the snow a very good distance. He also said that he’s had experience with three other brands and that this one is the best in his opinion and experience. 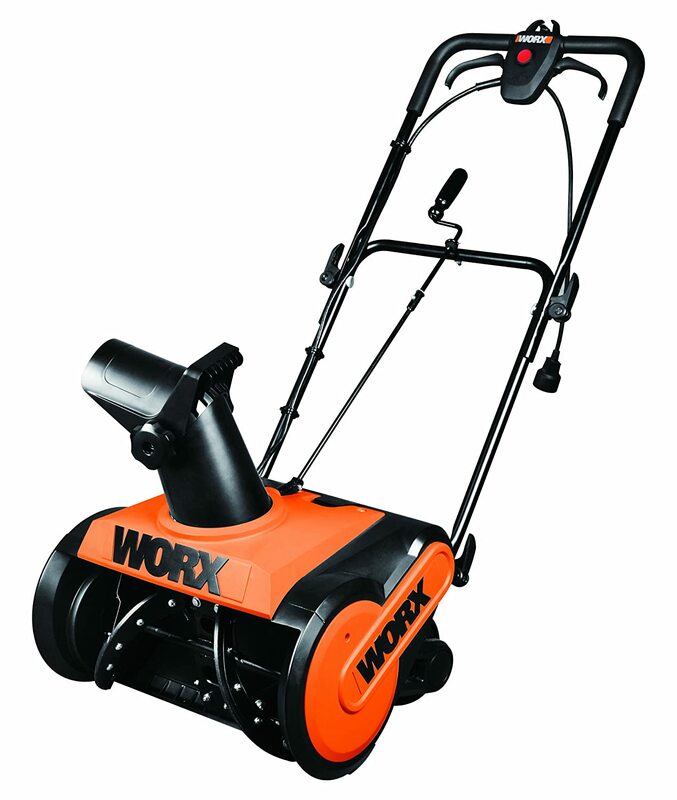 Another buyer who bought the WORX WG650 18-Inch 13 Amp Snow Thrower said that he got about three inches of sleet in January but that this thrower was of no use to him. He said that it did get a tiny bit of snow that fell, but that he did not do enough research to realize that this model was probably not a good fit. He advises people to first do their research, as this may have been an excellent product if his situation had been different. A third customer who purchased the WORX Electric Snow Thrower stated that he got eight inches of snow, but that the snow was about a foot deep in his drive way. He said that this product handled his situation like a true champion and that his neighbors were also impressed enough to purchase their own. He said that he did appreciate the power and the speed of this product. He said that he no longer has to shovel any snow and that his driveway is super clean now. The WORX WG650 Electric Snow Thrower is definitely a great product for anyone who wants to clear away snow in just a short time. Unlike other models, this one is ergonomic and environmentally friendly. This means that not only do you experience convenience in clearing snow from your surroundings, but you also contribute to the environment, by not using anything that emits toxic gases and fumes. Although I would recommend the Toro 38381 over this snower blower, I think you would still be happy purchasing the less expensive WORX Electric Snow Blower. Recently sales of snow throwers, such as the Snow Joe Ultra SJ620, have increased. This is because winter is finally very near. Autumn winds are blowing and leaves have started to fall, signaling the upcoming rain of snow. So once again we will face the problem of snow piling up around the house, including the roads and paths we need to move around. That is why once again we rely on our shovels or snow throwers to clear them all so we can use the paths. Shovels are a thing of the past, but there are still those that need it even today. But for someone who could afford a snow thrower, why settle for hard labor? Shovels are very inconvenient to use, despite their simplicity, and may cause a lot of strain on the back, especially for older individuals who use it. Clearing a whole yard full of snow will also take too long with a shovel. That is why many have opted to buy a snow thrower. Snow throwers come in different types. We have the gas/oil-powered snow throwers and the electric snow throwers. Gas/oil-powered snow throwers are messy with their oil and smoke, making many users shift to using electric snow throwers instead. And if you are intending to buy a new electric snow thrower, the Snow Joe Ultra SJ620 should be highly considered: being a snow thrower in itself it has enough features to make you want it. Snow Joe Ultra SJ620 simply convinces a lot of individuals of its great use. Many, who have bought the product, have experienced great ease in its use; the product also comes at a reasonable price. As you purchase it, you would see how durable its parts are. Add to that, upon assembly, many realize that it is in fact very easy to assemble. One even said that even a grandma can assemble one fairly easily. The size is also appropriate for easy storage. The best part about this product, according to many, is that it really does a good job in clearing snow off your paths. It does the job quick also as you can use it easily with its push-button technology, plus ergonomic handles. One even said it cuts through snow like butter! These results vary especially with the type of snow that you have in your yard. For some, they find it hard to clear wet snow and suggest that it is not recommended for wet snow more than 6 inches thick. Also, the machine automatically shuts down if it senses that it will overheat, so it can be a bother to those with large yards to clear. It is thus better to start first with clearing important paths before moving to other portions of the yard. The product definitely displays a great number of features. Ease of use and output are its main advantages. Although this snow blower would be better suited for smaller jobs. Just make sure to check your product upon purchase as there are some who found company defects on them. This would make sure your experience with Snow Joe Ultra SJ620 will be great. Take a look at a yard full of nothing but snow, and it will make you think of a snow thrower like Toro 1800 Power Curve Electric Snow Thrower. The hassle of all the snow falling and piling growing thicker inch by inch will already make your back ache: especially, if you’re used to clearing all of it with just a shovel. That said, if you have a snow thrower, then definitely, it can get a whole lot easier. However, not all snow throwers have the same quality of output. Add to it the hassle of simply making it start its engine like the gas and oil-powered snow throwers. Plus, it can be messy with all of the spilling oil and smoke that would come out of the engine. That is simply not very tolerable, but with an electric thrower, you are sure to be dealing with all the snow with ease. One of the best bought snow thrower is the Toro 1800 Power Curve Electric Snow Thrower. It is an electric thrower, which is very easy to operate. Plug it in and press a few buttons and you are off to cleaning the huge mess the snow has made in your paths. That is the beauty of having an electric snow thrower. Add to that its other features and you’d love to try it. Just like any other electric snow throwers, many have found it great to use Toro 1800 Power Curve Electric Snow Thrower, simply because you no longer need to worry about fuel, lubrication and spark plugs. Plug it in and it will do its job. It is quite very easy to use. Being an electric thrower also means that it has no need for maintenance. That is why many find it great, plus it is eco-friendly as it produces no smoke and does not leave traces of leaking oil/gas behind. However there are a few negative feedbacks from customers about the product. Many talks about the electric cord connection near the thrower getting disconnected upon use. Also, it is not easy to store as the metal bars cannot be bent for it to fit easily in many spaces. The tiny wheels also provide almost no traction upon use of the electric snow thrower. Despite the few negative feedbacks, many are still buying the product hoping its benefits outweigh most of its disadvantages. The best part is for most buyers it does. The disadvantage of the Toro 1800 Power Curve Electric Snow Thrower can easily be covered. That’s what you’ll feel when you clear your pathways with all the snow covering it.